I was so pleased with the scanner in the office that I bought another one for home. It is neat and does not take up too much space. It works speedily and fairly quietly. I am a satisfied customer and I am already recommending it to my clients and contacts. Kodak i40 feedback. This is a very compact and sturdy unit. Installation was trouble free and in use the machine is very quick and accurate with crisp images even at relatively low dpi’s. If it has a downside it is that it doesn’t like coated papers unless they are fed individually. It would have also been useful if it was networkable. Otherwise a really great buy. We quite like Tradescanners as well !! Not having used a stand alone scanner before I did not really know what to expect. I can honestly say that I have been somewhat impressed by this little machine. Very fast and clear imaging with easy output to tiff or PDF files. The gereral operation could not be simpler with "one touch button" operation. Setup took a little while but not overly difficult. We are a small legal office. Impressed with Kodak i40 scanner which does the job pretty well for the money, and now have two. Very occasionally papers misfeed.. So generally we scan 30 rather than 50 at a time. Good scanning speed. Rating 4/5. The Kodak i40 is a superb scanner. Easy to install and even easier to use. Had no problems with it at all and would recommend it to anyone. We purchased a Kodak i40 scanner back in December 2006 and we were very impressed with how the scanner worked, it is fast, efficient and fits very neatly onto the desk worktop. We were that impressed that we have recently purchased a second scanner for the office. I would recommend to anyone who are wishing to have paperless office in purchasing a Kodak i40. We purchased the kodak i40 scanner and tested it for a week. It was absolutely excellent. We have now purchased a further 7 i40's from tradescanners and have used them without any problems. I am extremely pleased with the performance of the Kodak i40 including the speed of scanning, the 'no noise' aspect and the actual size of the scanner which fits neatly at any workstation. I would rate this product as a 5. Automatic image cropping and straightening for outstanding image accuracy at full scanning speed. 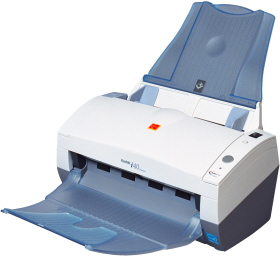 Fast scanning: Up to 25 pages (Kodak i30/Kodak i40) or 50 images per minute (Kodak i40). Simultaneous output: Colour and bitonal and greyscale and bitonal. Multi-feed detection to make sure every page gets scanned. Feature-rich bundled software makes it easy to maximize productivity right out of the box. KODAK Capture Software, Lite, installs in minutes and offers a range of scanning features for practically any workgroup application. Easily upgradeable to the full version of Capture Software. READIRIS Pro 8 Corporate Edition provides key functions for locating textual information fast, including multi-page optical character recognition (OCR) and direct scanning to searchable PDF files. For integrators, bundled ISIS and Kodak-developed TWAIN drivers deliver speedy system integration. For end-users, the exclusive, Kodak-developed TWAIN drivers enable Kodak's advanced image processing at the Kodak i40 document management scanner's full rated speed. Brightness and contrast control: Customize Colour output to fit your application. VRS compatible for more imaging options. Flexible Electronic Colour Dropout: Suppress non-critical red, green or blue background to improve forms processing. Quiet operation and small footprint: i40s fit easily on any desktop.